Yup, the weathers been causing havok on a few plants around. I saw a fully blossomed tree the other night while riding my bike. It’s amazing how much brighter and pinker blossoms look when almost every other plant around still looks like winters got a while to go yet. The trees in our street came into blossom in mid-June! Winter had barely begun and our street was filled with flowers & fragrance. Amazing. The temperatures we have been having in Melbourne the past few days are quite spring like when compared to normal wintertime temperatures in the northern US which are usually near or below freezing much of the time. We say “April showers bring May flowers.” The US spring begins offically on March 21. Absolutely beautiful. 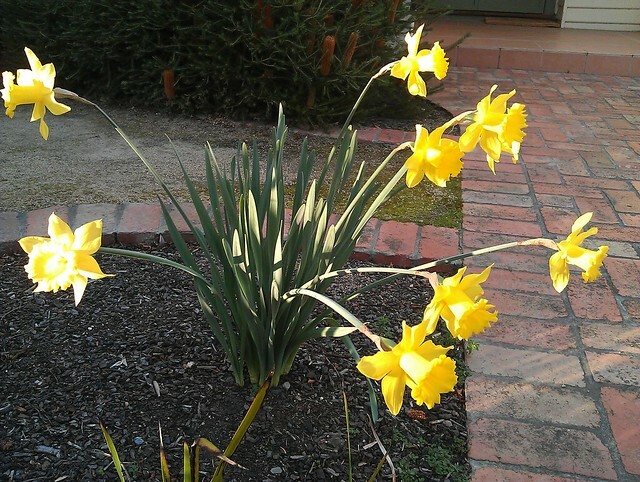 My favourite flowers – they look like sunshine on a stem! Same here, my daffs have also bloomed. I’ll blame it on the freakishly warm spell we’ve had the last few weeks .. it aint right! The flowers blooming early is unusual as they normally gauge their cycle on the rise & fall of daylight hours not temperatures. I’ve noticed there’s a lot of nesting activity amongst the birds around my place, not sure if it’s unusual for this time of year though? The plum prunus in my drive is sooooo beautiful…….and early !